A 10-year-old boy was rushed to the hospital in Kansas after being attacked by a German Shepherd and pit bull mixed dog. The attack took place in December but the boy is still in recovery and his family asks for financial help due to the duration of the hospitalization. Chance Orozco faces several more months in intensive care because he needs facial reconstruction to repair the injuries suffered in the approximately 20-minute attack. “He has lost his left ear and portions of his scalp. Vision in his left eye may be affected as well. 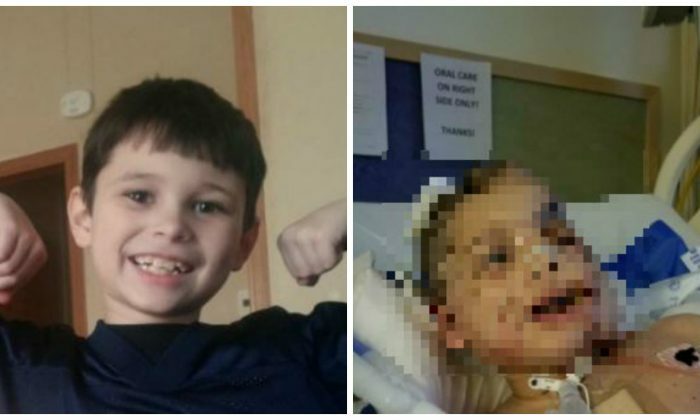 Today alone Chance has been in surgery for 8 hours,” the family said on GoFundMe. The goal of $5,000 has nearly been met as of January 3. The family of the boy says he was attacked while playing at a neighbor’s house. The father of Chance’s friend rushed to Chance’s home to inform his family of what happened. That man is also the owner of the dog. The reason for the attack is unclear; the dog was supposedly chained to a tree. While some would pinpoint the cause on the dog being part pit bull, Chance’s dad disagrees. “I don’t blame the breed of dog, I blame the owner because of what he taught the dog,” he told KWCH. There has been no investigation into the attack. An investigation into a similar attack several years ago in the same year, Garden City, culminated with police issuing citations for dog at large and animal bite, which combined could have resulted in up to 30 days in jail and a $500 fine. The final results of the citations were never reported on. KSN noted that a local ordinance that previously required pit bulls to be leashed and muzzled when they’re outside was changed.